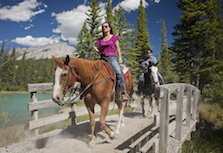 Banff Trail Riders is pleased to present a series of free weekend wagon rides of downtown Banff this holiday season. From November 18 to December 9, join us at the Trail Rider Store on Banff Avenue for a scenic 15-minute wagon ride led by a friendly cowboy or cowgirl guide. Wagon rides are perfect for the whole family and there’s no reservation required! Simply turn up at the Trail Rider Store and jump on the next wagon departing from right outside the store. Looking for other holiday events? Don’t miss the Banff Christmas Market at Warner Stables from November 22 – 25 with local Rocky Mountain gifts, a pop-up bar presented by Park Distillery, live music, sleigh rides, a visit from Santa and more! Available on a first come, first served basis. Wagon rides are weather dependent.